The fire sale the Chicago White Sox started last winter is far from over. There are still a few veterans on Chicago’s roster that GM Rick Hahn is likely to move this offseason. Next on the trade block appears to be Jose Abreu. Recent reports indicate that the White Sox are currently in “active talks” with several teams regarding Abreu. That doesn’t mean a trade is imminent. But based on Chicago’s recent history, there’s a good chance Abreu is traded at some point this offseason. Right now, the Boston Red Sox are the team most linked with Abreu. Boston is likely to move on from Mitch Moreland, giving them an opening at first base. The Red Sox are also anxious to add more power to their lineup. With his 33 home runs last year, Abreu fits the bill. Adding a first baseman like Abreu would also allow the Red Sox to keep Hanley Ramirez in the DH spot. Of course, the Red Sox aren’t the only team looking for a power-hitting first baseman. The World Series champion Houston Astros are another possibility. The Astros were in the running for Abreu before he signed with the White Sox in October 2013, so it’s reasonable that they’d still have interest in him. Abreu could potentially serve as Houston’s DH after Carlos Beltran retired. He could also take over for Yuli Gurriel at first base and push Gurriel to DH or possibly a corner outfield spot. The New York Mets are also another team to watch with Abreu. The Mets don’t appear sold on youngster Dominic Smith being the answer at first base. Also, they may be more comfortable with an established hitter at first base as they look to bounce back from a disastrous 2017. Abreu has two years left of arbitration, so he doesn’t require a long-term commitment. The Mets could favor a situation like that rather than pursue a first baseman in free agency. Two more teams that could make sense for Abreu are the Indians and Royals. The Indians are poised to lose Carlos Santana in free agency and could see Abreu is a potential replacement. The Royals are in a similar position with regards to Eric Hosmer. However, Cleveland isn’t expected to make a major move this offseason. Meanwhile, the Royals may hold out hope of keeping Hosmer before seriously considering alternatives. Regardless of the destination, it remains likely that Abreu will be traded before the start of 2018. He has two years of arbitration before free agency, and his salary will only increase after making nearly $11 million last season. With the White Sox unlikely to be competitive over the next two years, there’s no need for them to keep Abreu. 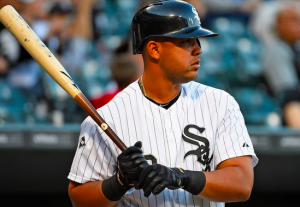 Where he’ll end up is still uncertain, but it appears increasingly likely that Abreu will be on the move at some point this winter.